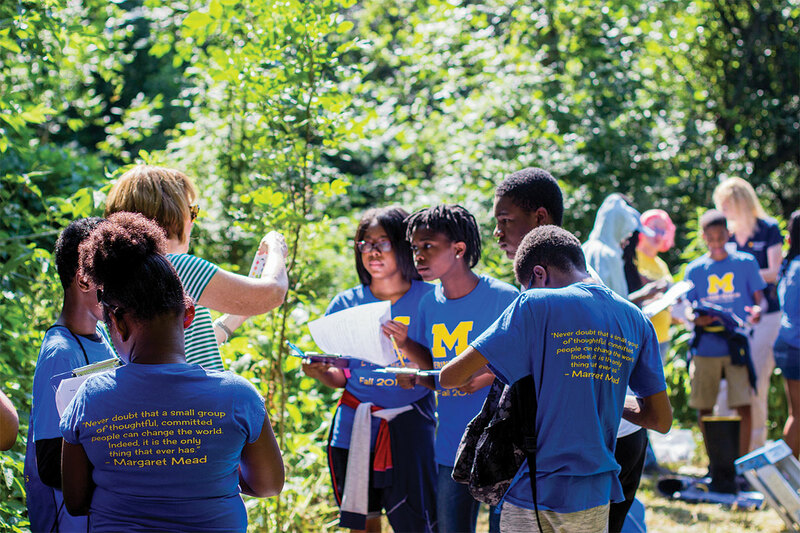 From July 23 to July 25, Matthaei Botanical Gardens & Nichols Arboretum, together with the youth education department, hosted the Wolverine Pathways scholars. These rising 8th and 11th graders visited from Ypsilanti, Detroit, and Southfield school districts for activities and experiences in environmental education. As part of my summer intern project, with the help of Children’s Pograms Coordinator Liz Glynn and fellow interns Franny MeLapy and Doris Duke Conservation Scholar Tiffany Wu, I developed an activity to lead with the rising 11th graders discussing climate change and how it impacts ecosystems and individual species. I worked very closely with Tiffany as she developed the presentation and communication component of the project and I developed the field activity. The key concepts were all in front of me: climate change, the greenhouse effect, ecosystems, species distribution and adaptations. These were the absolute minimum concepts students would have to grasp in order to participate in the activity but I wanted to weave them throughout the activity as well. These concepts are heavily intertwined but the challenge would be delivering the information in a logical progression so as to not overwhelm the students. In the end, we ended up with a very cohesive and robust program that accommodated the different skills levels of each student from each school district. While here, students observed and identified native plants on the trails, took biodiversity measurements in flagged sections of the trail and used their data and observations to make predictions about ecosystem impacts based on predicted impacts to an assigned tree species. Students also created ecosystem models showing the connections between the living and nonliving components of our local ecosystem and communicated their results to their peers. I learned that the students in the Wolverine Pathways Program are exceptional. Wolverine Pathways is a highly competitive program so I expected students to come in with some understanding of the concepts. But I was very pleased and impressed to hear they had some familiarity with the concepts already which encouraged them to participate. I found that listening to students’ ideas and engaging with them as equals brought out their motivation to achieve and contribute to tasks such as reducing human greenhouse gas emissions. The students from Southfield and Detroit specifically do not have readily available access to large natural areas aside from city parks. While there was some hesitation around insects, most students seemed to really enjoy their experience and find tranquility in nature. We expected to face challenges with larger group size. On one day we had to fit over 60 students, docents, and program staff on the trails. Thanks to her skills and preparation, Tiffany was able to assist me as a second group leader during the entire program as we split the groups between two previously marked sites. Through coordination, we reunited the groups at just the right time to return to the visitor center. As part of my intern project, I developed an evaluation to measure the success of this activity. Students were given a survey upon arrival to Matthaei Botanical Gardens that asked questions about their attitudes towards the environment. The survey also asked students to self-report their understanding of the concepts listed above. At the end of the program students were given the same survey in order to track changes. Survey results were calculated at the group level as opposed to the individual level. Overall, students reported increased understanding of the lesson concepts after having completed the program. Students in general also reported an increased feeling of connection to nature and an increased willingness to work towards a more sustainable future. In addition, students drew two ecosystem models during the program: one upon arrival and one after returning from the field. The changes in the models are inspiring. After returning from the field the groups had an increased awareness of species names and an increased understanding of how species interact with each other in our local ecosystem. Planning, coordinating, and conducting the Wolverine Pathways program was such a rewarding experience. These students are the future and after a week with them, I feel that the future is in good hands. I am also extremely grateful to my supervisor, Liz Glynn, for supporting, mentoring, and guiding me as I developed the program; to the docents and interns who volunteered their time and worked diligently to engage and inspire these scholars; and to Tiffany for leading with me and for developing a phenomenal communications lesson. Santiago was a summer 2018 intern in the youth education department at Matthaei-Nichols. He is a master’s student in the University of Michigan School for Environment and Sustainability (SEAS) focusing on conservation ecology. He obtained his undergraduate degree in chemistry from the University of Colorado, Colorado Springs, with an emphasis on environmental chemistry. His current research interests are in the fields of agricultural and soil ecology and he is conducting a research thesis with Dr. Jennifer Blesh, assistant professor in SEAS, to study the effects of cover crop mixtures on soil health on farm fields in Washtenaw County. Santiago has always enjoyed investigating the world through the sciences and turning those discoveries into engaging and inspiring stories for others. He hopes to be able to combine his experience in the sciences to promote wonder and curiosity with the youth who visit the botanical gardens this summer! Santiago’s internship was made possible by a gift from Ian and Sally Bund that will help sustain and promote the current and future nature educational programming at Matthaei-Nichols. Figure 1. Example Ecosystem Model before field activity. Figure 2. Example Ecosystem Model after returning from field activity. Same group. Figure 3. Students presenting their updated ecosystem models and proposed environmental management strategies.